Ladurée is a famous pâtisserie, or pasty shop, in Paris that is well-known for its yummy, rainbow-colored assortment of macarons. Many visitors flock to the main Ladurée store along the Champs-Elysées, but have you heard about the second most famous macaron stop in Paris: Pierre Hermé? Pierre Hermé actually worked at Paris competitors Fauchon and Ladurée before striking it out on his own and now has a number of locations named after himself. Whereas Ladurée is known for its Belle Époque store décor and more traditional offerings, Pierre Hermé is known for innovative and creative flavors combinations. For instance, one of the current seasonal macaron flavors at Pierre Hermé is olive oil with mandarin orange and cucumber water! Now, if you’ve been reading my blog you’ll know we already discussed our discovery of macarons at Ladurée during our 2012 Paris visit which you read about here. But on our subsequent visit this past Spring, after reading Amy Thomas’ Paris, My Sweet: A Year in the City of Light (and Dark Chocolate) (a delightful, fluffy book about a New Yorker eating sweets in Paris), I decided that I not only needed to return to Ladurée but I also needed to visit Pierre Hermé and conduct a proper tasting to compare macarons from both pâtisseries. Ethan lovingly obliged my crazy macaron tasting notions and we jaunted around Paris collecting our colorful specimens. 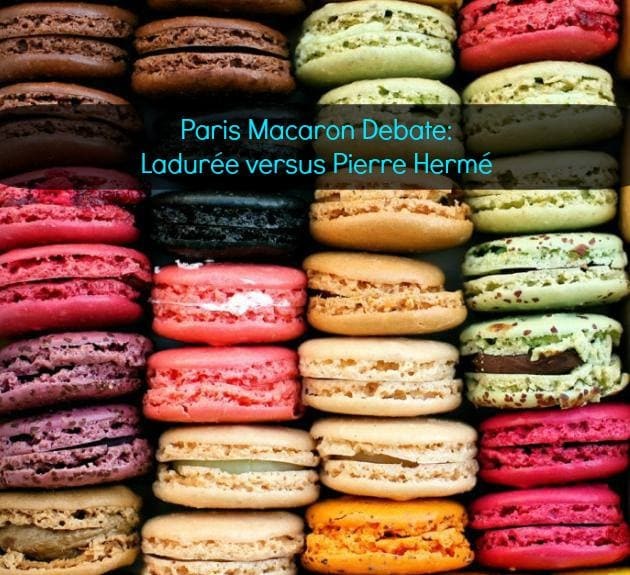 The Ladurée macarons were bought at the Champs-Elysées location and the Pierre Hermé macarons came from their rue Bonaparte store. Pricing: The mini macarons at both stores are almost identical in pricing (ask for a simple bag to go for the best price, otherwise you get a pretty box that costs extra) with the cost of the half-dozen macarons totaling 11.10€ at Ladurée and 11.70€ at Pierre Hermé. We must be challenged because again this year some of the macarons got a bit squished during our metro rides. Perhaps it would be worth paying for a box (we just buy them in bags as it costs less) to help protect the macarons from us! Nonetheless, they still tasted great and let me present you with the Second Annual Independent Travel Cats Macaron Tasting! Each macaron was carefully cut in half and we each tasted them in the same order, both sipping some great French tea in between yummy bites. The researcher/scientist part of me really tried to give each store an even chance. Ethan – Ladurée – just a little more of a rose taste…maybe? Verdict: Ladurée, but this was the hardest decision of the three as both were very similar in flavor and texture. Um, it pretty much ended up being a draw. But we still had another 6 macrons (3 from each store) so we saved these for the next day for Part 2 of the macaron tasting. Paris Macaron Tasting Day Deux! The following evening we sat down to the difficult task of tasting the leftover half-dozen macarons that weren’t directly comparable to one another. We decided to cut each macaron in half and both taste all six of the remaining flavors and then ranked them. 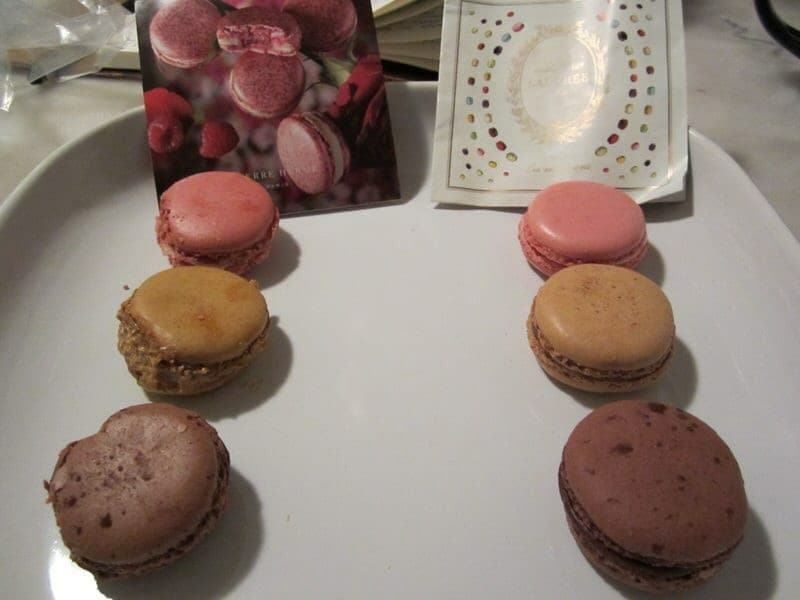 The Verdict of the Great 2013 French Macaron Tasting…. Well, honestly, it was pretty much a tie across all our tastings. In the actual head-to-head challenge, it was a draw. In sampling a selection of three additional macarons from both stores, you can see that even though Ethan and I didn’t always agree, we both favored macarons from both Ladurée and Pierre Hermé. So unfortunately we were not able to solve the long-raging debate about which pastry shop makes the best macarons and I think it all comes down to a personal preference. Some of our favorites from the 12 were PH Salted Caramel, Ladurée Rose, and PH Crème Brûlée. You can also check out our Ladurée favorites from last year. Overall, it was a draw and whereas Ladurée might win for consistency, texture and store décor, PH is clearly the winner if you are looking for some adventurous, innovative flavors. We suggest you try both and conduct your own “professional” macaron tasting—we had a blast doing this. While Pierre Hermé has not yet come to the U.S., there is a Ladurée location in New York, but we suggest that this activity is best done in Paris! Have you tried Ladurée or Pierre Hermé macarons or other treats? Have a favorite? We’d love to hear your opinions and recommendations. 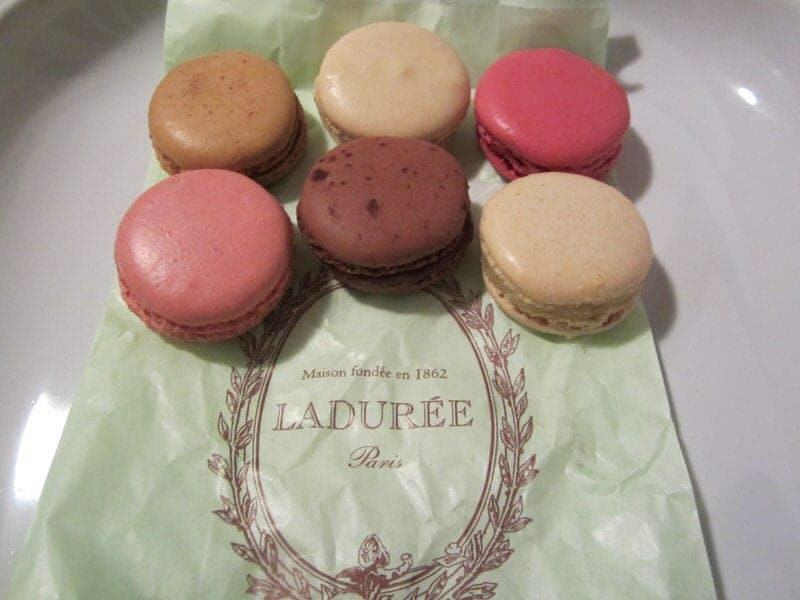 Have tried both Laduree and Pierre Hermes macaroons during our visit to Paris last spring. And the one flavour that really elevate my appreciation to this beautiful treat is Laduree rose. Love the light texture that they won’t lumped in my mouth, and the subtlety of the rose flavour. I think that Ladurée wins with the more traditional flavours. But, nevertheless, I prefer Pierre Hermé macarons as the flavours are more “bold” and unique! I did a ranking of some of Pierre Hermé’s macarons. Check it out if you want! Yes, I think it is definitely a matter of a opinion as both are good but different! For me I remember starting in 1982 when Laudere made the very large macaroons in only chocolate and cafe? I nearly died when I tasted them. Now it’s all the small ones in many different flavors and, they are delicious but nothing like the large ones in only two flavors!, I miss so much of the old Paris but know about progress!! Back then unless you traveled to Paris, people in the states didn’t even know about a French macaroon! Now they are everywhere and I laugh to myself and say to myself if people only new!! I personally like Pierre Herme’s better than Ladurée which are too chewy for my taste. My favorite macarons in the states are in Maryland. Andrea Carmona French Macarons (www.andreacarmona.com). They have well over 12 flavors and are to die for! Great to hear an opinion from someone else who has tried both types of macarons! I think it is just a matter of preference as we liked certain macarons better from Ladurée and certain ones from PH. I would never have thought to look for macarons in Maryland – although we just had a couple decent macarons in a tiny shop in South Korea so you just never know! I have just recently found Macarons here in the states. Oh my goodness. I had a salted caramel that was so incredibly delicious. I’ve never tasted anything with a texture like it before. I MUST travel to Paris to try these famous macarons. I know, macarons are just so delicious! I am glad we have both recently discovered this colorful little treats. Thanks for stopping by and hope you keep following us! Oh, yes it was a tough job:) The French-style macarons have become popular in the U.S. as well but so far we haven’t had great luck in finding comparable ones. How are the ones in Costa Rica? We were just told by a friend who has spent a lot of time in France that we have yet to try the best ones in France and that we’ll have to check out some other places when we return, so this may call for another macaron smackdown in the future! The olive oil with mandarin orange and cucumber water sounds intriguingly delicious. I love the “Macaron Smackdown” – such a great idea! Any future smackdowns in the works? Oh my gosh, I love this! I haven’t ever had a “real” macaron (the ones that ride along on dessert samplers don’t count) and I don’t want to try one until I can get the real deal…so I guess I’m waiting til I can go to Paris! These look so good and I cracked up over the fact that you had a macaron taste-off. Cheers! 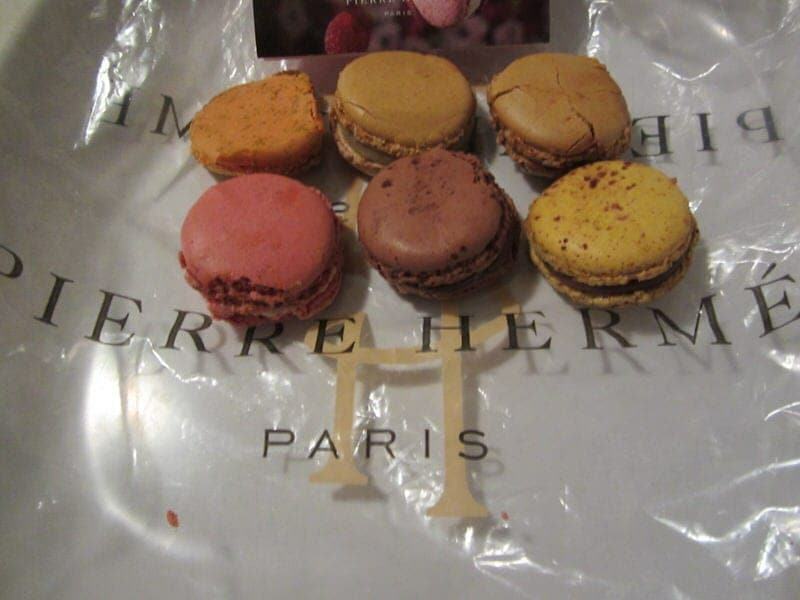 Yes, in addition to macarons, Pierre Hermé is well known for many of his other pastries and desserts as well. Yes, I made myself really miss macarons while writing this post! This is brilliant. I was thinking “why didn’t we do that?” and then I saw the prices, which I also saw in the shops there, and remembered that we were living off 15euros a day for all meals 😉 I’ll have to stick to jellybean tasting, though these photos and flavours do make me want macaroons! Next time in Paris, you could conduct a petite tasting with just one or two flavors, I think the mini macarons are less than 2 euros each at both stores. You can find much cheaper macarons elsewhere though as many bakeries and even McDonald’s sell macarons in Paris! I just ran across this fun blog article where people did a blind test comparing Laduree and McDonald’s macarons.